London, U.K. (Friday 23 February 2018) Kylie Minogue, currently on a high with her brand new track 'Dancing', will bring her extraordinary creativity as a live performer back to the stage this autumn when she plays a UK and Ireland tour. 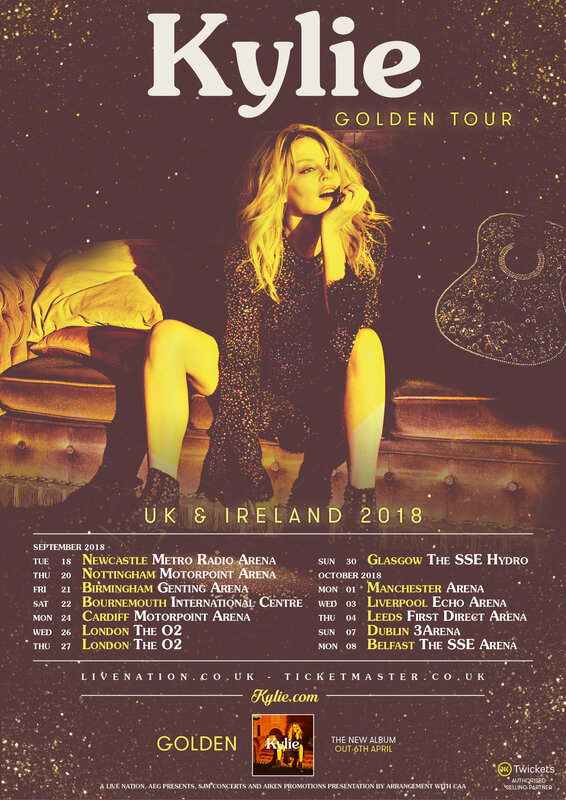 Kylie, who always thrills with her live performances, promises a brand new extravaganza for this production which will be centred around her new album 'Golden', although of course her amazing back catalogue will be embraced. Tickets for the shows go on sale via all regular outlets, including Ticketmaster, on March 2nd and can also be purchased via Kylie’s own website - http://www.kylie.com. Kylie fans can take advantage of a special pre-sale on February 28th. For info on the presale please see https://kylie.lnk.to/live.